Yosemite….. our last national park of the US – this also meant no more camping after this stop for a very long time. I was anxious to get it over with :). We entered into the park and it was stunning. Just beautiful, just like each park we had been to prior. We found a rockin’ campsite just outside the park which allowed us access to a pool and a hot tub. Officially the best campsites of the trip were found in Yosemite and this was just the start of it. 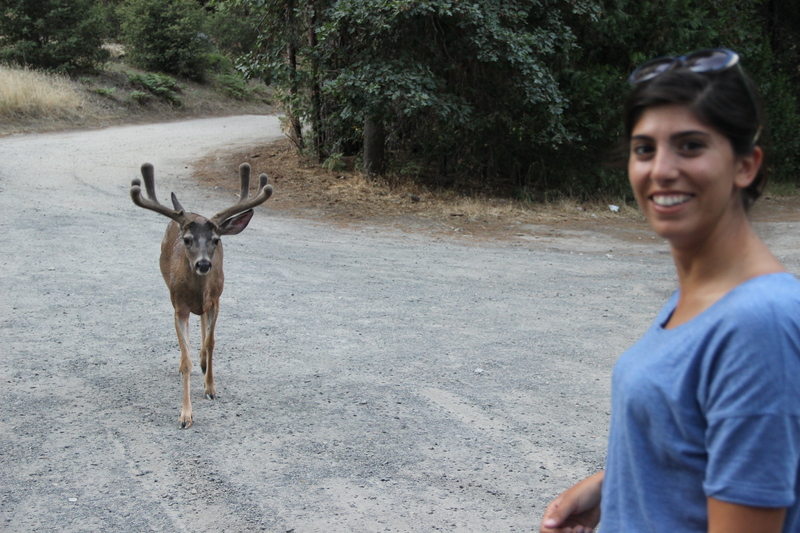 During our first day of exploring the park – we came across a pair of mule deer, a 6 point and an 8 point. We pulled over to take pictures since they were fairly close to the road. Rob had the camera and I stood by the car. The 6 point began to inch near me…Rob started snapping pictures. The deer inched closer and closer until he backed me against the car and got within 5 inches of me. Our first day had started off pretty exciting. We cut our night early as we had a big day ahead of us…. Half Dome was waiting for us on day 2. 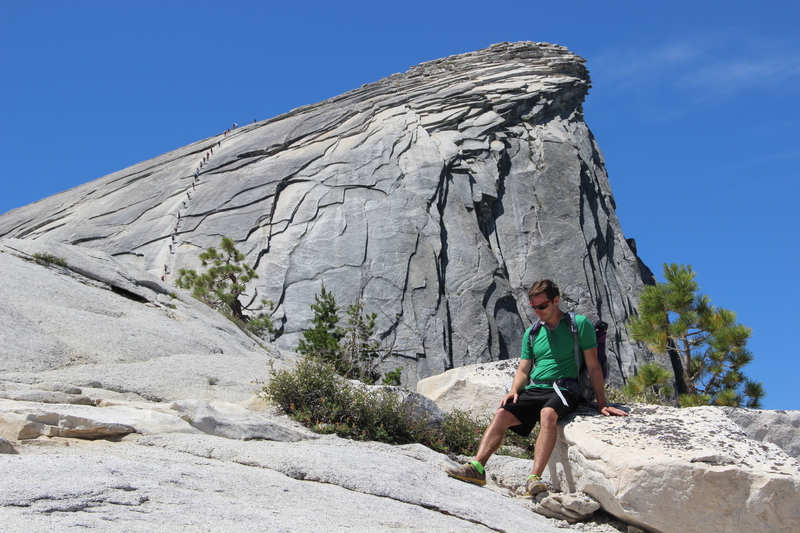 Rob had done Half Dome once before many years ago and made it sound tough but definitely doable, although when I heard 16 miles roundtrip with 5000 ft. elevation gain – I was a bit skeptical of his eagerness to go a second time. We started the hike at 6am and it was going good for the first couple of miles. Steep but not crazy. Then there is a point where the trail splits…. 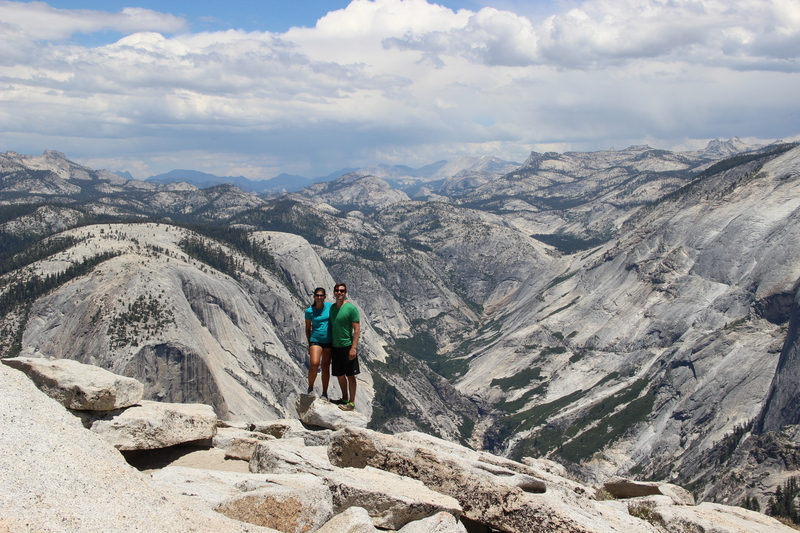 Do you go the John Muir Trail (longer but less elevation) or do you go the Mist Trail (shorter but more elevation). We decided less distance would be better since it was going to be tough either way. I didn’t realize how tough it would get. All I could see ahead of me were dirt stairs so steep that I had to use my hands to help me up each stair. I was began to get rather upset that Rob tricked me into this hike! But I continued on. We stopped at our first waterfall – BEAUTIFUL! So far it seems to be worth the hike. As we headed to the second waterfall the terrain changed and the stairs disappeared. We were now just going up insanely steep hills… one after the other with no break. Our legs were starting to feel it for sure. Then a couple of hours from the first waterfall we came across the second one which was even more powerful than the first. We still had a long way to go. The trail continued uphill, the terrain continued to change – from rocky, to forest, to open fields, to sandy grounds. It kept the hike interesting. Finally we got to sub-dome. The calm before the storm I guess you could say. The view was unbelievable. I looked up at where we had to go and thought….there is no way I will make it up that high. I will sit right here and let Rob go up and come back. After a short break though, I decided that I wasn’t going to hike 15.5 miles just to skip out on the last part. So off to the cables we went. This part was tricky, especially when you have a fear of heights and there are hundreds of other people on the cables at the same time as you as well as a small impatient Asian man who is behind you, basically pushing you up the mountain. It was a stressful last leg, but when we got to the top, everything we had done was well worth the view. It was unbelievable. I have never seen anything like that before. After some time at the top, we worked our way back down to the pool and hot tub that was waiting for us. We were pretty beat after such a big hike so we spent day 3 relaxing, driving around the park and swimming in the river. Not much to report. and then worked our way back down to head back to our car. about 60 feet away. I went into a panic! Rob urged me to take a picture but I refused to make any sort of noise. After what felt like an eternity, I was able to get our pots and pans out of Rob’s backpack along with our bear spray and hand them to Rob. He then took the pots and pans along with a stick and started banging them as loudly as he could to scare off the bear. 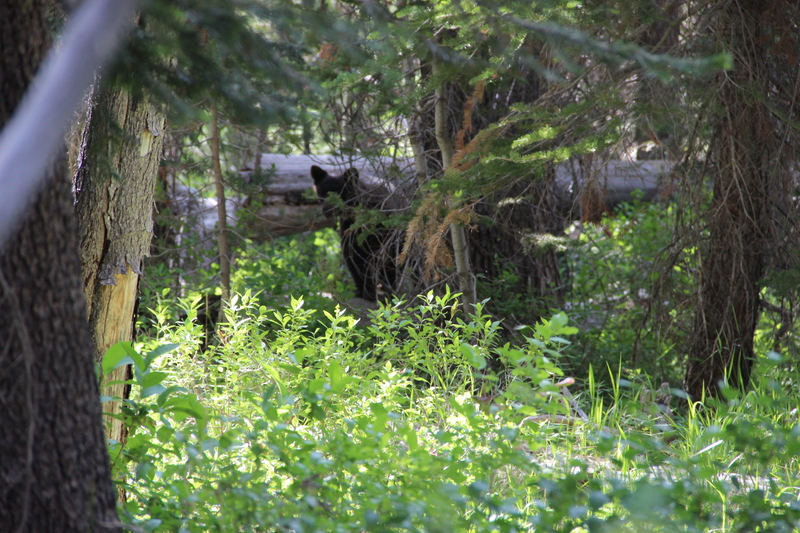 The bear scurried off about 20 feet – stood up on his hind legs and stared us down and then eventually went back to eating his leaves and we went back to our hike. Our last night we stayed at Summerdale campground on the south end of the park. We were pleased to find out that this campsite had a waterfall close by for us to use. 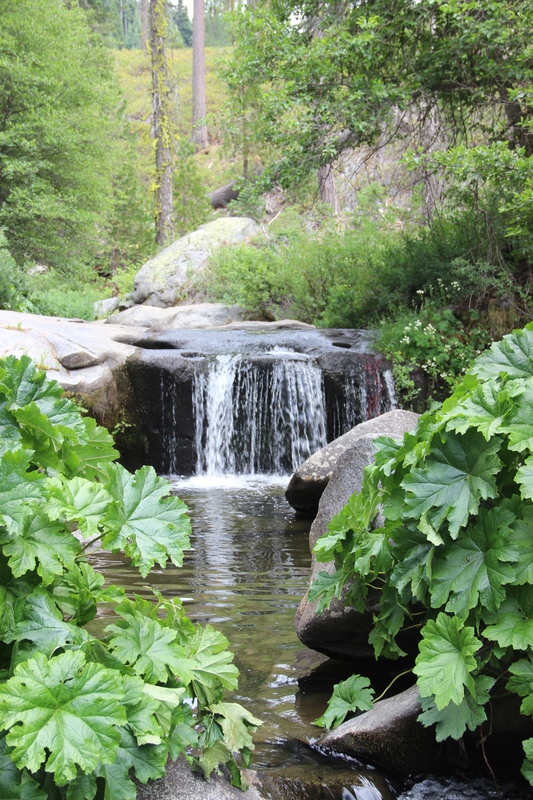 We went up the street to rinse off and hang out in this waterfall and found out that it was beautiful! After spending about 10 minutes in the water, I realized that we were not alone in there. In the pool below the waterfall were HUGE crawfish! I was not okay with this. Rob was loving it. He began catching them left and right. We ended up with about 15 crawfish which we took back to camp and boiled up for dinner – it was an excellent end to our time in Yosemite.